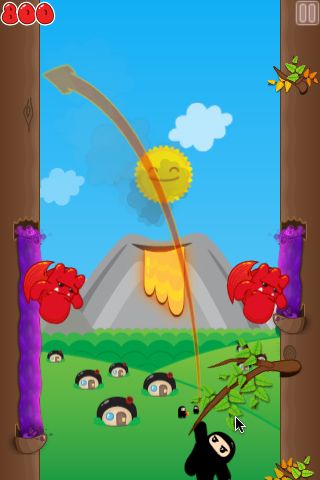 Pajama wearing tough guys rule the high jump in this cute and very addictive iPhone game. Ninjas, at least in video games and movies, are ruthless assassins that have no qualms spilling blood with razor sharp swords and throwing stars, not exactly the cuddliest looking people. We'll make an exception, though, for the adorable pajama wearing dudes in Ninjatown: Trees of Doom!, available on iPhone for $1.99. These cute little guys, who first appeared in Ninjatown on DS in 2008, are at it again, but they ditched tower defense for good old fashioned jumping. The result is one of the most addictive Apps we've played. This time, the goal is to appease Ol' Master Ninja by climbing the feared Trees of Doom, much to the chagrin of arch nemesis, Mr. Demon. You begin the journey at the bottom, and must leap between the trees by tapping them. If you want to jump to the tree on the left, for example, simply press that tree. Meanwhile, a counter in the top left corner of the screen records the meters traveled. As expected, Mr. Demon planted a bunch of obstacles for your ninja to overcome. 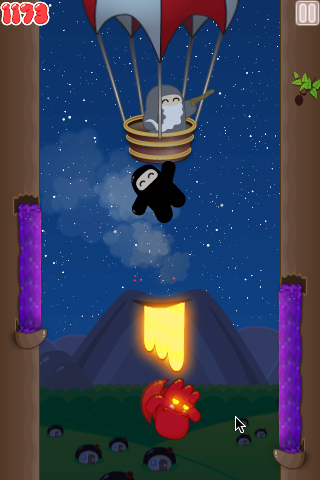 These include a purple goop that oozes from certain parts of both trees, a bunch of angry demons flying about, shaved bark (your ninja loses his grip) and even a volcano that spews lava balls. Since it only takes one hit to kill the ninja (yes, he restarts at the beginning), it's in your best interest to learn the environment and each monsters' pattern. Thankfully, the game has a series of power ups, including a shield (can only absorb one hit), a superhero cape (automatically launches you upwards) an hourglass (temporarily slows down bad guys) and other helpful items. It also appears that they're random, so don't jump into a game thinking the superhero cape will appear in the exact same spot. It won't. You'll also need to deal with the fact that your ninja cannot climb down to reach power-ups he missed, nor can you direct his next landing spot with pinpoint precision. If you want him to hit a mushroom, for instance, you can't press said mushroom and expect him to reach it. Instead, he may jump right into that purple slime, or a demon's path. That notwithstanding, Trees of Doom! succeeds because its simple premise begs for multiple plays. Doesn't matter how awful we perform, we always fire it back up to see if we can break 1,000 meters or higher. It also helps that the game has a bunch of achievements to unlock, from reaching certain heights (a whopping 10,000 meters) to hitting other milestones (collect five Ninjatime Hourglasses in one game). In addition, you'll receive online leaderboards, Twitter and Facebook integration, thanks to the Plus+ Network. It only takes a few minutes to sign up, and from there, you can annoy your friends with an endless stream of Farmville like updates. Finally, Ninjatown's one good looking video game. Everything's in 2-D, but the little cartoon ninjas and attractive backgrounds (the volcano, day turning to night) shine on the iPhone. All of this makes Ninjatown: Trees of Doom! one you can't miss. Perfect for long trips or just a couple of rounds a day, it's an irresistible and well-designed App that's affordably priced and a lot of fun. What's Hot: Super addictive, cartoon-style graphics, leaderboards, Facebook/Twitter support, in-game achievements. What's Not: Tree branches don't always respond to touch, cannot climb back down.